Of the six Americans who started the Tour de France last year, only four finished. One of the casualties was New Hampshire-born cyclist Ted King of Cannondale Pro Cycling, who separated his shoulder in a nasty crash a few kilometers from the finish of Stage 1 in Corsica. For three days following the crash, he rode through the pain, until he missed the time cut-off by a disputed seven seconds in the team time trial (his bike may have lacked a timing chip). After falling back due to his injury, he rode out the race alone. Controversially, he was not given a stay of execution despite his display of courage and was dismissed from the race. This year he’s back at the Tour in a support role to help Cannondale ace Peter Sagan defend his sprinter’s green jersey. Before lining up in Yorkshire for Le Grand Départ on July 5th, we tracked down the 31-year-old plaid bike jersey fashion designer and chatted about pain, his dismissal from the Tour, and exactly how difficult a 21-stage, 2,272-mile race really is. Cycling involves suffering and intense physical and mental pain. Is it something you get used to? What'd Greg LeMond say, "It never hurts less, you just go faster"? Something like that. Yeah, cycling is funny because there are so many levels of pain: lactic acid pulsing through your legs, the mental fortitude it takes to know you could always ease up...but you won't. Plus it goes without saying, there's not a lot of padding in spandex and pavement is very hard. Cycling is a vicious sport. During an average day of racing a grand tour, how much of it is spent hurting and how much of it is fun and relaxing? The days are long with four, five, six hours spent in the saddle. They can be rough, fast, and hard. But it's not like you're cross-eyed with exertion 100% of the time. The race starts out aggressively, that can be anywhere from five minutes or 50 miles; then there will usually be some sort of lull followed by some fast and furious in the final few hours. So to use proper cycling nerd vernacular, "in the pain cave," ohh, we're probably there 30% of the time. Then another 30% is what we would call fairly easy (but a sprint to the average bloke), while an additional 40% is just plain hard, but we'll call it just outside of the pain cave. How unpleasant is a mountain stage? That probably depends on who you ask. I imagine climbers, such as Chris Froome, like them more than the average person. The ebb and flow of a grand tour is funny though; some days you feel great while others you seem to be suffering start to finish. Sure, mountain stages are tough, but they're part of the adventure. You’re no stranger to taking a tumble. Does it all just happen so fast? Yup. Turns out I broke my scapula in that tumble too. Some folks pretend to "know how to fall," but the reality is that when you're in the midst of it, gravity takes over and you don't have much say. You might aim for grass over the tarmac, but that's more circumstantial than anything. Your Tour ended last year when the Tour organizers said you missed the time cut-off in that time trial by seven seconds. Do you hold a grudge? What was going through your mind as you rode alone in the team time trial? Back on question one; we discussed both physical and mental toughness. Well that comes to quite a head in that exact scenario—namely, being alone, injured, and really vulnerable in a TTT. There's an intangible amount of mental grit required to get through that knowing what's on the line. All the while your fractured bones are grinding on bones and lactic acid is searing through your entire body. That was a tough day. Is the anticipation the worst part of a three-week race? Yup. It's a big undertaking, but if you go in with that super intimidated outlook, you're already unbalanced on your back foot which is no bueno. So I don't do that. What is the most taxing part of the biz: chasing down a breakaway, time trial-ing, or huffing in the gruppetto? Honestly the most taxing part is the crazy lifestyle that's required for success. There are countless sacrifices made, birthdays/weddings/anniversaries/holidays missed. Having very understanding and supportive friends and family makes a world of difference. The travel is also generally really monotonous. 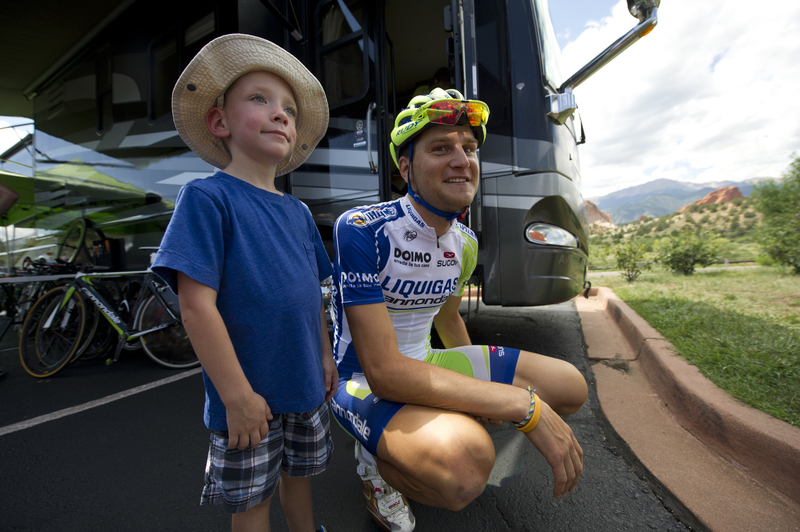 After you finished your first three-week stage race (Giro), what did you do the following day? Returned home to America and ate some Ben & Jerry's. I think I took the day off the bike. Two days later I did my local group ride. It amazes me how much my early departure from last year's Tour has defined such a big part of my career—namely, just making it to the Tour. Plenty of the world's best cyclists at this ProTour level will never line up for this race. Especially as an American, it's our World Series, Super Bowl, and Mardi Gras all wrapped into a three-week circus. As I've traveled the globe and especially zipping across America the past 12 months meeting people, friends, fans, I'm humbled how quickly folks empathize and then are even apologetic about how my 2013 Tour went. Their sincere hopes of "We're rooting for you to be back Ted!" stunned me, to know how much people care. Earning that starting spot last year was enormous. Re-earning it in 2014 has been enormous. *Ed. Note: Interview was conducted before King bowed out of this year's Tour. You live in Boulder, Colorado. Do you think it’s silly that the performance un-enhancing drug cannabis is a substance banned by USADA? No. We are under the rules of the World Anti-Doping Agency, which oversees all Olympic sports. So it might not be performance enhancing in the sport of cycling, but a snowboarder who needs to mellow out before dialing a sick run or an archer who needs to chill out before firing an impossible shot can find it extremely helpful. I just follow the rules, man. What are the first things you reach for when the season’s done? When race season ends, beer season begins! I also love brownies. Brownie batter is even better. Ethan Wolff-Mann is an editor at Supercompressor. He shares an alma mater with Ted King. Follow him on Twitter @ewolffmann.